Superior corona radiata/posterior gray matter clusters. This white matter cluster included deep white matter of the superior longitudinal fasciculus, superior corona radiata, and body of the corpus callosum (A, C, D) and included mostly (68% of voxels) superior–inferior-oriented voxels. 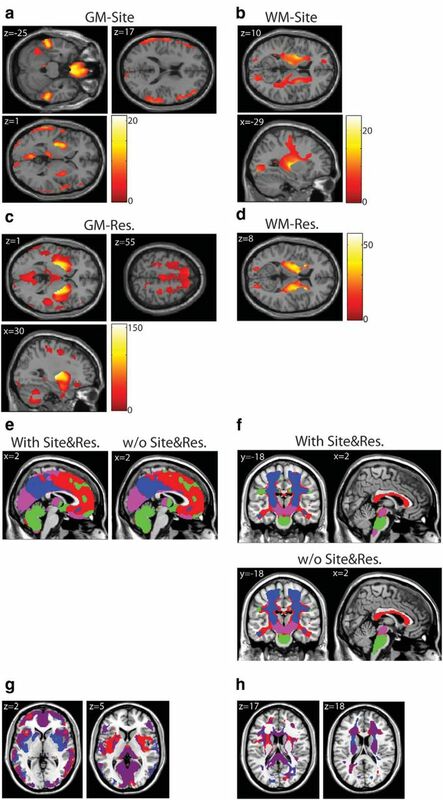 The corresponding gray matter cluster included primarily posterior cortical regions (A-D), including precuneus (B) and bilateral intraparietal sulcus (C). Mean gray and white matter slopes for the cluster with SDs (E) and a graphical illustration of volume trajectories (F) are shown for all four age bins. GM, gray matter; WM, white matter. Medial callosal white matter/anterior gray matter clusters. This white matter cluster included medial corpus callosum (A), anterior internal capsule (D), and superior parietal lobule white matter (C) and was primarily ordered left–right (70%). The corresponding gray matter cluster included anterior cingulate and medial prefrontal cortex (A, B, C) and insular (B, D) and temporal regions (B). Mean gray and white matter slopes for the cluster with SDs (E) and a graphical illustration of volume trajectories (F) are shown for all four age bins. GM, gray matter; WM, white matter. Frontal and occipital white matter/visuomotor gray matter. This white matter cluster included mostly superior–inferior-oriented voxels (74%) in superior cerebellar peduncle (A), occipital and superior parietal (B) and superior frontal gyrus white matter (C, D), posterior thalamic radiation (B, C), and precentral gyrus white matter (D). 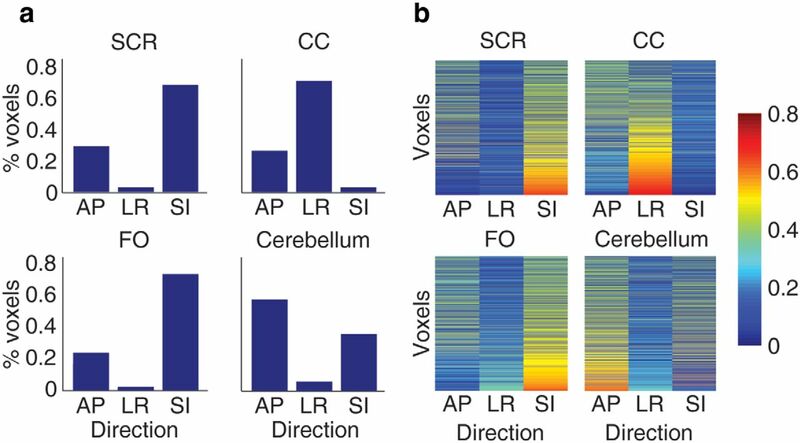 The corresponding gray matter cluster recruited cuneus (A, B,C), motor (D), superior parietal (B), and lateral prefrontal (C) regions. Mean gray and white matter slopes for the cluster with SDs (E) and a graphical illustration of volume trajectories (F) are shown for all four age bins. Cerebellar white and gray matter clusters. This white matter cluster included the cerebellum and cerebellar peduncles (A), including white matter in portions of the superior longitudinal fasciculus (C); voxels in this cluster were predominantly oriented anterior–posterior (58%). The corresponding gray matter cluster included the bilateral cerebellum (A), caudate (B), and dorsomedial prefrontal cortex (D). Mean gray and white matter slopes for the cluster with SDs (E) and a graphical illustration of volume trajectories (F) are shown for all four age bins. Preferred white matter direction in each cluster. For this analysis, the voxels within each cluster were thresholded to only those voxels with an eigenvalue ≥0.4 in one of the three canonical directions. a, Shows the proportion of voxels for the maximum value in each direction. b, Illustrates eigenvalues for all three directions across all voxels with at least one eigenvalue ≥0.4, sorted by maximum value in each row (i.e., each row is one voxel; heat map indicates the eigenvalue at that voxel for each canonical direction). SCR, superior corona radiata; CC, corpus callosum; FO, fronto-occipital; AP, anterior–posterior; LR, left–right; SI, superior–inferior. Effects of site and resolution on regional volume and clustering results. a, b, Results of an F-contrast for effects of site, thresholded at p < 0.001 uncorrected, on gray and white matter volume, respectively. Site effects were identified around the putamen and internal capsule as well as medial orbital and peripheral gray matter. 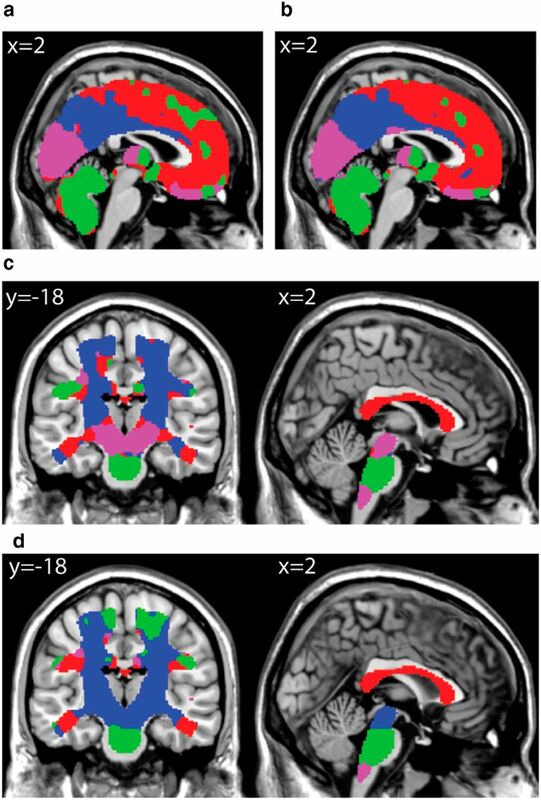 c, d, Results of an F-contrast for effects of resolution, thresholded at p < 0.001 uncorrected, on gray and white matter volume, respectively. Effects were again concentrated around the internal capsule, with gray matter effects in dorsal prefrontal, occipital cortices, and cerebellum. e, f, Illustrate clustering results for age β-estimates from gray (e) and white (f) matter models that included effects of site and resolution (left and superior) and from models that did not include these effects (right and inferior). We note that these are largely similar. g, h, Illustrate regions of overlap (purple) and difference (red and blue) in cluster assignment for gray (g) and white (h) matter clusters when site and resolution are taken into account. The only substantial differences in clustering results were in posterior putamen and near the internal capsule. GM, gray matter; WM, white matter. Gray and white matter clusters derived from models accounting for total tissue volume. a, b, Gray matter clusters for models using proportional scaling (a) and ANCOVA (b). c, d, White matter clusters for models using proportional scaling (c) and ANCOVA (d) models. Clusters are similar to Figure 6, e and f, with a notable difference in the white matter cluster in the midbrain for the ANCOVA model (d). Mean, SD, and range were calculated for age and IQ in each group. Handedness reflects right (R) versus left (L) hand preference. Mean adjusted income is measured in thousands of dollars.